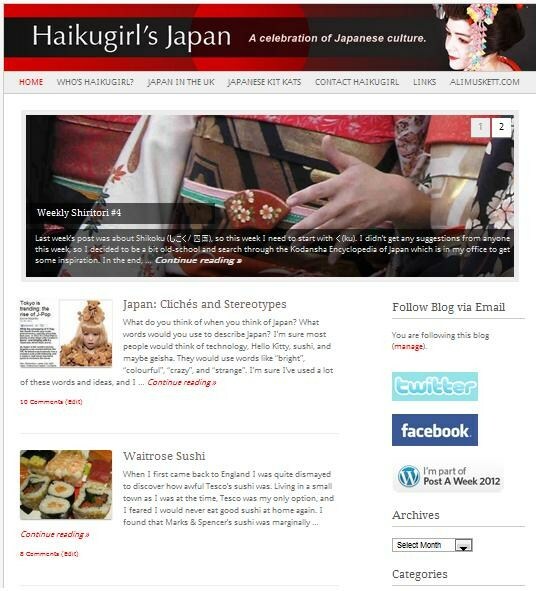 Haikugirl’s Japan can now be found at haikugirl.me (although haikugirl.wordpress.com still works). I’m using a different WordPress.com theme, called Fresh & Clean. My homepage now features “sticky” posts, which highlight my current top posts. The “Who’s Haikugirl?” page has been completely updated, so if you don’t know who I am, please take a look. My blogroll can now be found on the “Links” page. Definitely looks better! I’m liking it. I really like the much brighter design! wow, the theme “fresh and clean” makes it look so, well, fresh and clean! 🙂 nice work. I like the redesign, Ali! Very crisp.